It's officially party season! Today I'm sharing a festive, feminine office-party look with one of my favorite shades of the season: bordeaux. Bordeaux, vino, burgundy, cranberry, maroon -- they all fall into the same deep-red color family with the slightest tonal variations and are all so pretty! I'm adding classic, navy stripes and a sprinkling of gold accessories to add a little shimmer and shine, too. This look is simple yet elegant, and is one that's perfect for an office holiday luncheon or party that is dressy but more conservative/business-formal. Party season is all about the glitz, glam, and sparkle! As fun as it is to put on all the jewels and break out the sparkly bags and clutches this time of year, I pared it down for this particular look to keep it professional and office-appropriate. One of the easiest (and one of my favorite) ways to add a touch of sparkle to any look is to add a brooch to your blouse/top. I've collected a few vintage ones over the years that I treasure and rotate frequently, but this Chanel brooch was my pick for this look because I think it adds just the right amount of extra polish. Chanel brooches, while spendy, can still be found at discounted prices if you shop around and if you don't mind buying pre-owned. I simply adore the timeless, pretty design of this brooch. I've purchased unique pieces like this from various luxury/designer re-sellers over the years, but personally prefer Fashionphile to all of them. They have a huge and ever-changing inventory of stunning designer goodies including bags, scarves, shoes, jewelry, and more, including several that are rare and hard to find! Some of the top featured designer brands include Chanel, Saint Laurent, Hermès, Gucci, Louis Vuitton, and more. All of their items have been authenticated and are 100% guaranteed, which takes away the worry and anxiety of spending your hard-earned money on any possible counterfeits. Also, once the items have been on their website for 5 days or more, they're eligible for a layaway payment option, making it easier to pay for your item in installments over the course of 60 days. It can definitely make large purchases more palatable! I've also had nothing but wonderful experiences with their team, and have recommended them to several friends because they're that amazing. And no, this post isn't sponsored by Fashionphile; I've just been really impressed with them as a returning customer and have been meaning to share my honest feedback and personal experiences with you. Gold glitter pumps are another must-have for the season! They finish this festive office-party look and are a pretty complement to the sparkle of the brooch. Mine are older by Vince Camuto and are the "Cresida" style, but I found a few nearly identical ones here, here, and here if you're in need of some for your upcoming events! 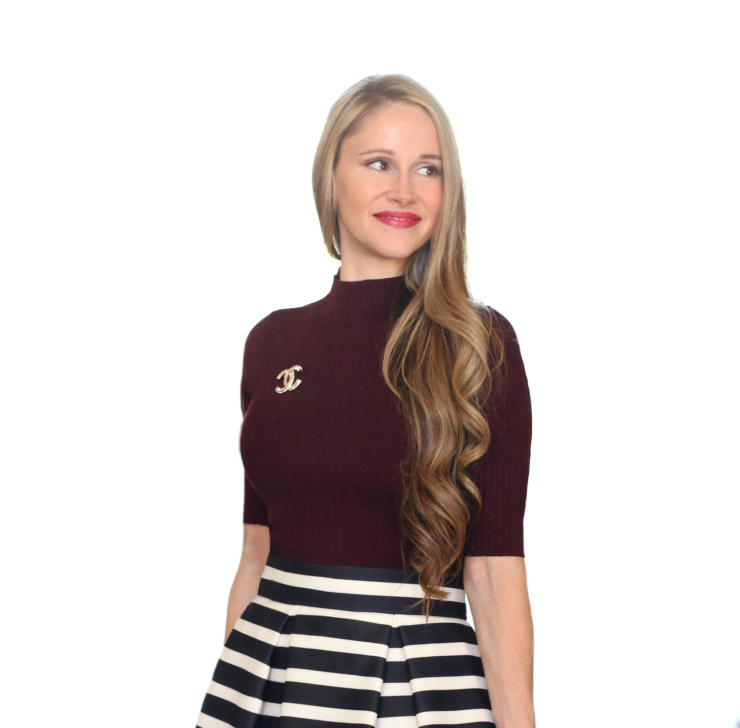 Bordeaux, stripes, and a touch of gold = office-party-ready! I love the simplicity of this look and think it would work well for a number of other special events where you want to be dressy and stylish in a tasteful, understated way. MAC Lip Duo in "Diva/Burgundy"
What are your go-to outfits for office holiday parties? Do you like to dress to the nines or do you prefer to keep it simple and follow the less-is-more principle? Thanks so much for stopping by! Stay tuned for another festive look that's coming to the blog soon with the most dreamy lace! Last-Minute Gift Ideas: $50 or Less!